You must be at least 18 years old to work at OdySea Aquarium. Accounting Assistant is responsible for processing Accounts Payable and Receivable, as well as assisting with maintenance of various general ledger accounts. Other responsibilities include gathering and processing information from third party vendors and assisting with internal projects. Accounting will also assist the Accounting Manager with other duties as assigned. Maintains accounting databases by entering data into the computer; processing backups. Verifies financial reports by running performance analysis software program. Determines value of depreciable assets by running depreciation software program. Maintain general ledger accounts and performs account reconciliations. Generate accurate and timely financial information and reports to management. Develop and analyze financial reporting of operations, including budget variances. Performs calculations and records transaction, including payables and receivables. Supports merchant processing, including credit card refunds. Manages corporate purchasing card program. Maintains systems for revenue recognition for annual and lifetime pass holders. Follows all accounting policies and systems, including general ledger, financial reporting and record maintenance. Provides support in annual budgeting process. Assist Accounting Manager with special projects, information requests and audit preparation. Communicate and work with other departments to support and monitor the business operations, including upcoming events, new developments and other Aquarium activities. Perform other duties as workload necessitates. Successful completion of a pre-employment drug testing and background investigation. Allergies related to animals or plants, which might interfere with ability to work, must be controlled by medications or protective equipment. Ability to push/pull up to 50 pounds. Must be willing to work a minimum of 40 hours per week, including weekends and holidays. Ability to stand for long periods of time, as well as walk. Ability to use hands to finger, handle, or feel; and reach with hands and arms. Ability to balance, stoop, kneel, crouch, climb stairs, or crawl. No impairment of sight, smell, hearing, touch, balance and agility of movement which might interfere with ability to work. Specific vision requirement for this job include close vision, color vision, depth perception, and the ability to focus. Must be able to take directional cues directly or indirectly. Ability to work in an environment that may be loud at times. 2- 4 years of progressive accounting experience. Experience with cash handling, bookkeeping and accounting systems. Above average ability to organize, manage time and set priorities while meeting deadlines. Ability to be flexible and shift priorities to meet departmental requirements. Ability to maintain a high level of professionalism, integrity and confidentiality. Ability to research and analyze various types of data information. Must be able to handle confidential information. Strong computer skills, including Microsoft Office (Outlook, Word, Excel, Powerpoint). I am empowered to take ownership of any opportunity to exceed expectations. I anticipate guest needs and pay attention to the details. I treat all internal and external customers with respect. I have an attitude of gratitude. I get it right the first time. I display actions that are moral and ethical. I always provide alternative solutions. I am committed to learning every aspect of our product and services. I use the 10/5 rule, 10 feet I acknowledge my guest’s presence with a smile and at 5 feet. I greet them with a courteous word. I take personal responsibility for our surroundings. I am accountable for my tools and resources. I value the contribution of every team member. For questions or other information please email [email protected]. 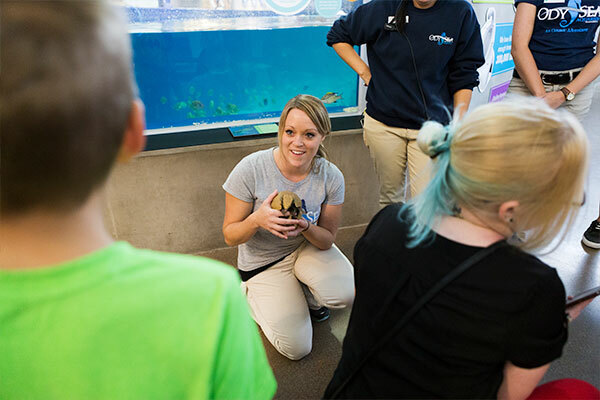 OdySea Aquarium has internship opportunities available in several departments, including Education, Animal Care, Aquarist, HR, and Guest Relations. Interns must be at least 18 years old, adhere to professional grooming standards, and must be able to commit to a minimum of three full days each week during the internship semester. Internships are unpaid, but offer a valuable hands-on learning experience to build your resume. To find out more or apply please visit our internship page. We are accepting applications for volunteers. Click here to see a list of available positions and to submit your application. You must be at least 18 years old to volunteer at OdySea Aquarium. Unlimited Entry for 1 Year. Skip the line at the Ticket Window. 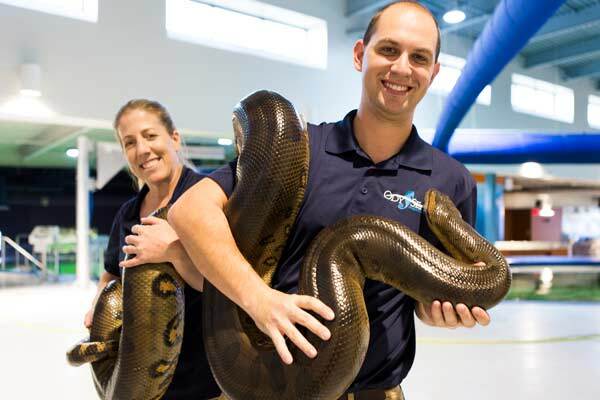 Discounts on Animal Encounters & Tours and at the Cafe and Gift Shop. Plus invitations to special events throughout the year.